Branding matters. Our country is seen as Shangri-la; our environment pristine; and our people preoccupied with GNH. We enjoy a premium brand. But what’s happening to the environment in Shangri-la is definitely not GNH. 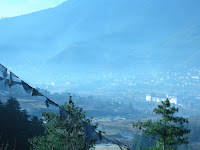 I took this photograph of Thimphu on my way to work this morning. What we breathe is not good for our health. And not good for our image. Branding is difficult. And expensive. Let’s protect what we have.